Noun & adjective. In senses A3, B3 also b-. Late Middle English. 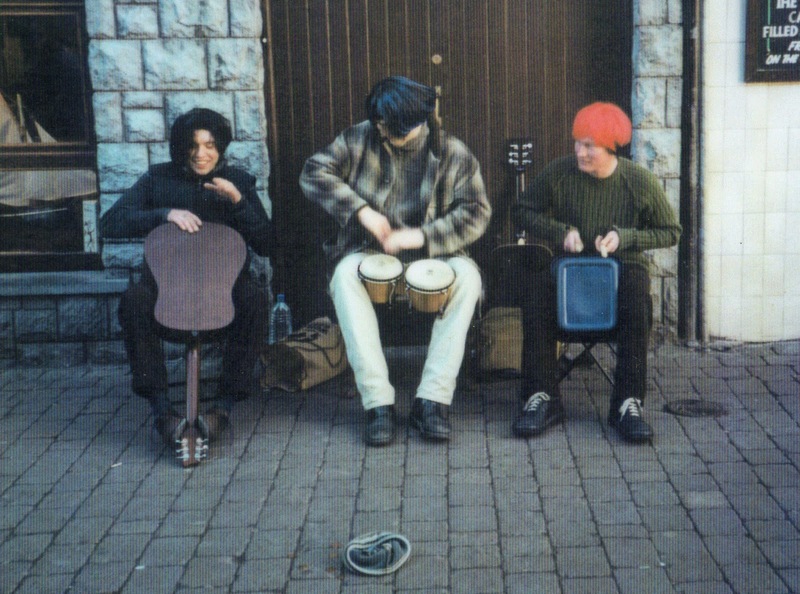 Me (centre) busking in Galway, Ireland with friends in 2001. We'd make enough money to buy fish and chips for ourselves which made us very happy. Noun & adjective. Colloquial. Early 20th century. A2 noun. A person who has an unconventional or Bohemian way of life. I overheard someone describe me as Bohemian once. It was when I first moved to Ireland in 2001, living in a grotty cheap house with four other guys, spending my days in my room, furiously writing the novel that I was convinced would change the world, and my nights with my like-minded housemates, writing songs and playing music, philosophising and solving the problems of mankind from our living room. It was a happy, loose and exciting time, and the man that said it (the visiting father of my Spanish housemate) said it with no malice or judgement, but rather a wry smile at the whimsical, carefree nature of youth. I took it as a great compliment. That I might be at least a little Bohemian wasn't a completely alien concept. My Mum would definitely fit many of the characteristics: eccentric, unconventional and individualistic, she had often commented that she felt she had Traveller or Gypsy blood in her, so inclined was she to be constantly moving and changing her scenery. As for me, I can see why someone might have described me so. I've always had artistic and literary aspirations, I can bore very easily and flit from one thing to the next, and I'm more interested in unconventional ways of thinking than those that follow the crowd. If Bohemian and Boho also mean cool and fashionable, however, than this is where my Bohemian credentials falter as, while I have an observer's appreciation for these things, I have very little interest in them personally. But then perhaps that's part of truly being Bohemian. Like eccentricity, if you want to be eccentric (some might say even if you realise you're eccentric), then you'll never truly be eccentric. Likewise, if you're choosing or trying to be Bohemian, then chances are you're not and you never really will be. I'm probably not either; I don't think I am. But then I wouldn't know, would I? Do you know what it means to be Boho? Do please leave your most unconventional and artistic comments below. I've often wondered if one's main existential choice is between creativity and central heating. On the whole, though, I find it harder to type if I'm wearing thick woolly mittens. It's funny you should say that, because during that period we were often without heating. And when we'd all pool enough money to fill up the oil in the house, we'd ramp the heating to full, throw open the windows and loll about half-naked in the cloying heat until, three days later, the oil would run out and we'd be without heat again for another month. That's pretty boho, right? I'm quite certainly not bohemian. I don't even have a pair of sandals. I have friends who try exceptionally hard to be bohemian, but they don't really hit the mark. Contrived boho just isn't boho. The picture from Galway does make you look particularly bohemian by association, if nothing else, with the busker on the right who looks as though he was born under a hemp tipi in a co-operative organic mushroom farm somewhere close to the trendy quarter of Bohemia. Yeah. Trying to be boho just ain't boho. Neither does being boho by association. I do, however, own a pair of sandals (Boho Stats +1) and they're about 10 years old (Boho Stats +5). If you had sewn some sort of inspirational message onto the sandals' straps, like 'make love not war' or 'save the whale - stab a Japanese fisherman', that would be boho stats + 10. Yeah, but if I do that now, it's trying to be boho, which is -50. And trying to statify boho-ness is -100 for sure, but +10 geek cred. Yeah. I'm a geek. That's definitely what I am. Geek is bohemian in it's own way. Believe me, it's better than blatherskite. Boho-geek instead of boho-chic. I like it. I'm not bohemian, at all. I worry too much about anything and everything to ever fit into this carefree lifestyle. Also, I'm trying to figure out if that's your real hair, in the picture. So... shiny... and... bowl-cut-y. So what do you think Bibi? Is that my real hair? Good call. I can't remember who, why or how, but someone handed us three wigs while we were busking, so that's none of our hair. That might be your hair, but they are definitely not your bongos. So did you ever finish the novel?